I just got off the phone with a prospective client for the first time. His team is generating more than 10,000 new members a month. That’s awesome — a great effort and commendable result that’s getting them featured in many marketing industry speeches. What isn’t getting featured is the fact that this same company is losing 9,500 members each month. This means they spend 95 percent of their marketing efforts replacing the members who quit. Because 27 days of each month are spent replacing canceled members, their marketing department has 30 days of monthly expenses with only 3 days of growth. 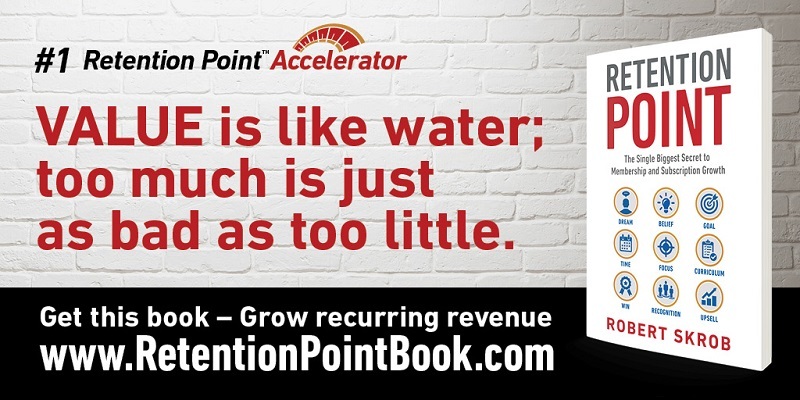 If you know of anyone who’s in this position — or if you are in this position — I’m sharing more than 25 years of membership growth experience in a new book I authored called Retention Point: The Single Biggest Secret to Membership and Subscription Growth for Associations, SAAS, Publishers, Digital Access, Subscription Boxes, and all Membership and Subscription-Based Businesses. This book details the Member On Ramp copywriting template I use to create member welcome sequences that stop members from quitting. It also reveals the top five mistakes Membership Marketers make that prevent them from retaining their members. If you’ve tried to improve retention by creating some sort of onboarding sequence and it didn’t work, chances are you made one or more of these mistakes. If you are depending on membership to grow your company, this book could change everything for the better. More new members, longer member retention, higher lifetime customer value, and more recurring revenue — all of this makes your company more valuable. Most Membership Marketers believe they are geniuses when they launch their membership program and see it grow. Members join, revenue increases, and the numbers grow, but the program eventually reaches a plateau. I’ve seen it thousands of times. Membership grows until it reaches a point where the number of new members each month just barely replaces the number of members who quit each month. Then life becomes really frustrating because you are spending thousands of dollars and countless hours just to break even after your monthly losses. And increasing the rate of new members only seems to increase the number of members who quit.